This is the interface between the liquid (top) and hexatic (bottom) states. CREDIT: Oxford University. At the end of a detailed study, researchers at the University of Oxford’s Department of Chemistry have established experimental proof related to melting of two-dimensional materials. The outcomes of the research can be used to assist in technological advancement of thin-film materials such as graphene. 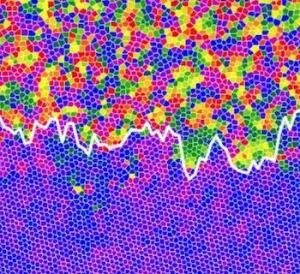 Scientists from the team of Professor Roel Dullens from the Department of Chemistry have experimentally clarified the way in which two-dimensional solid of hard spheres get melted. Their research has solved fundamentally significant yet pending problems in condensed matter science. Moreover, the outcomes of the research form the basis for in-depth knowledge and advancement of two-dimensional materials. Melting is a phenomenon in which a material transforms from a solid phase to a liquid phase, and there is only a basic knowledge of this phenomenon. Although we regularly come across this phenomenon in day-to-day life in home, workplace, or around the environment, for many years, researchers have been attempting to get a fundamental knowledge of the melting process. Although melting of a solid into a liquid is a commonly encountered scientific phenomenon, perceiving this change is specifically unexplainable in the case of two-dimensional solids. In this case, the much lauded Kosterlitz-Thouless-Halperin-Nelson-Young (KTHNY) theory suggests that an intermediate, partially disordered state—the “hexatic” state—occurs between the solid and liquid phases. There have been considerable attempts to obtain an in-depth knowledge of such “topological” transitions. The Nobel Prize in Physics for the year 2016 was awarded to Kosterlitz and Thouless for their attempts in the same field. However, in the case of the basic interacting system of various particles—two-dimensional hard spheres—there is a surprising deficit in agreement in spite of the fact that the first simulations were carried out more than 60 years back. Dr Alice Thorneywork and her colleagues adopted optical microscopy for analyzing monolayers of colloidal model hard spheres which were slightly tilted to introduce a gradient in the particle concentration. The properties of hard spheres are determined by this concentration, thus enabling the research team to identify and characterize the liquid, hexatic, as well as solid states and the characteristics of the transitions between these states in the same experiment. The outcomes demonstrate that the melting takes place through a continuous solid-hexatic transition succeeded by a first-order hexatic-liquid transition.